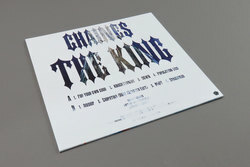 Chaines - The King. Vinyl LP. Bleep. Mancunian artist Cee Haines delivers eight tracks of avant-garde electronic compositions that sit between fantasy soundtrack works and distinctly modern classical, Jacques Brodier-esque world building. Immediately notable is ‘Knockturning’, a singular piece that although warranting a Brodier comparison also makes the records most unique moment. 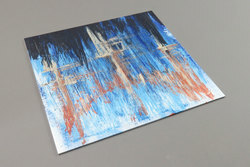 Elodie Lauten/Richard Skelton style mourning on ‘DOWN’ also suitably delivers whilst ‘Population 5120’ takes us off into dreamland with drifting, barely there vocal murmurings and soft piano motifs mixed with what sounds like a muted foghorn. Recommend this one strongly for fans of Touch, Penultimate Press, Kye etc.